Anatomical findings of vitreoretinal interface in eyes with asteroid hyalosis. 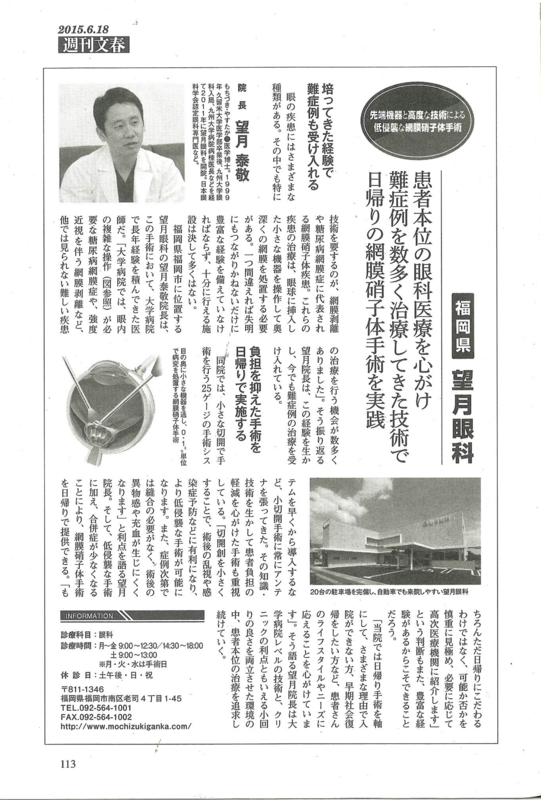 Mochizuki Y, Hata Y, Kita T, Kohno R, Hasegawa Y, Kawahara S, Arita R, Ishibashi T. Graefes Arch Clin Exp Ophthalmol. 2009 Sep;247(9):1173-7. Posterior vitreous cortex characteristics of an eye with asteroid hyalosis. Retinal Cases & Brief Reports. 2(3):184-186, Summer 2008. The internal limiting membrane peeling with brilliant blue G staining for retinal detachment due to macular hole in high myopia. Mochizuki Y, Enaida H, Hisatomi T, Hata Y, Miura M, Arita R, Kawahara S, Kita T, Ueno A, Ishibashi T. Br J Ophthalmol. 2008 Jul;92(7):1009. Surgical results of combined pars plana vitrectomy, phacoemulsification, and intraocular lens implantation. Mochizuki Y, Kubota T, Hata Y, Miyazaki M, Suyama Y, Enaida H, Ueno A, Ishibashi T. Eur J Ophthalmol. 2006 Mar-Apr;16(2):279-86. Evaluating adjunctive surgical procedures during vitrectomy for diabetic macular edspana. Mochizuki Y, Hata Y, Enaida H, Yoshiyama K, Miyazaki M, Ueno A, Murata T, Sakamoto T, Kubota T, Ishibashi T. Retina. 2006 Feb;26(2):143-8. Retinal capillary hspanangioma managed by transpupillary thermotherapy. Mochizuki Y, Noda Y, Enaida H, Hata Y, Ueno A, Yoshikawa H, Ishibashi T. Retina. 2004 Dec;24(6):981-4. Mochizuki Y, Ishibashi T. Ophthalmologica. 2012 May 30. 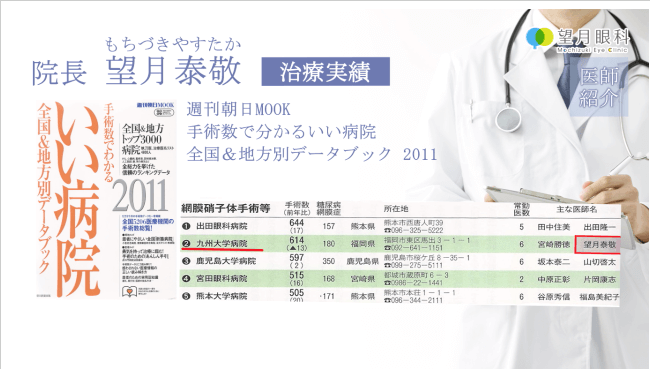 Mochizuki Y, Aiello LP, Ishibashi T. Br J Ophthalmol. 2011 Dec;95(12):1745-8. Mochizuki Y, Arita R, Kawahara S, Kita T, Miyazaki M, Hisatomi T, Ikeda Y, Aiello LP, Ishibashi T. Am J Ophthalmol. 2010 Aug;150(2):223-229. 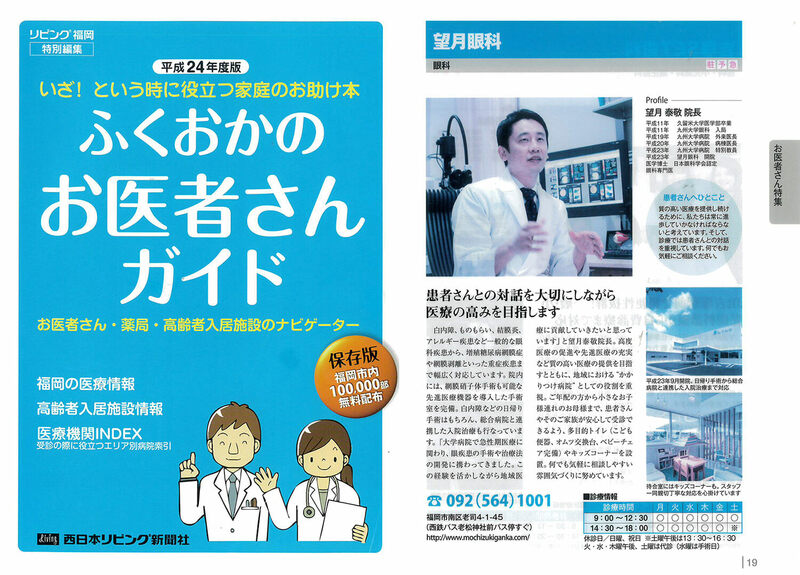 Mochizuki Y, Arita R, Kawahara S, Kita T, Noda Y, Ishibashi T. Graefes Arch Clin Exp Ophthalmol. 2009 Nov;247(11):1455-9. Mochizuki Y, Aiello LP, Ishibashi T. Br J Ophthalmol. 2009 Aug;93(8):1020-6. Mochizuki Y, Enaida H, Sonoda KH, Ishibashi T. Br J Ophthalmol. 2009 Aug;93(8):1016-9. Mochizuki Y, Enaida H, Goto Y, Shimokawa H, Hafezi-Moghadam A, Ishibashi T. Proc Natl Acad Sci U S A. 2008 Nov 11;105(45):17504-9. Mochizuki Y, Enaida H, Kagimoto T, Goto Y, Hafezi-Moghadam A, Ishibashi T. Diabetes. 2008 Oct;57(10):2784-93. Mochizuki Y, Enaida H, Ueno A, Hafezi-Moghadam A, Ishibashi T. Invest Ophthalmol Vis Sci. 2007 Oct;48(10):4426-32. 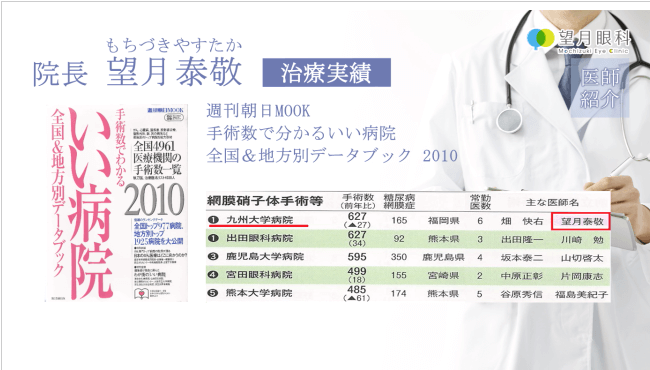 Mochizuki Y, Sakamoto T, Ishibashi T. Eur J Ophthalmol. 2007 May-Jun;17(3):392-8. Mochizuki Y, Goto Y, Kubota T, Hata Y, Ishibashi T. Retina. 2007 Apr-May;27(4):499-504. The internal limiting mspanbrane peeling with adjunct use of brilliant blue G staining for retinal detachment due to macular hole in high myopia. Annual Meeting of the Association for Research in Vision and Ophthalmology. May 6-10, 2007 Fort Lauderdale, Florida, USA. Vitreous cortex characteristics in eyes with asteroid hyalosis. The 21st Congress of the Asia-Pacific Academy of Ophthalmology. June 10-14, 2006 Singapore. Triamcinolone-Assisted Vitrectomy for Asteroid Hyalosis. Annual Meeting of the Association for Research in Vision and Ophthalmology. April 30-May 4, 2006 Fort Lauderdale, Florida, USA. Surgical results of combined pars plana vitrectomy, phacoemulsification, and intraocular lens implantation for various vitreoretinal diseases. XVI International congress of eye research. August 29-Septspanber 3, 2004 Sydney, Australia. Effect of triamcinolone-assisted pars plana vitrectomy on proliferative vitreoretinopathy. Annual Meeting of the Association for Research in Vision and Ophthalmology. May 4-9, 2003 Fort Lauderdale, Florida, USA. Evaluating adjunctive surgical procedures during vitrectomy for diabetic macular edspana. Annual Meeting of the Association for Research in Vision and Ophthalmology. April 25-29, 2004 Fort Lauderdale, Florida, USA.